The ICEHOTEL Jukkasjärvi, Sweden is the first of its kind and was first created in 1990. 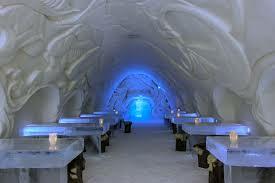 It is now known as the biggest hotel of snow and ice in the world, spanning over 6,000 square meters. Situated 200km North of the Arctic circle it is one of the most remote luxury resorts in the world. This remote location gives its guests the feeling of complete disconnect, allows for spectacular views of the Aurora Borealis, or Northern Lights. With no major towns or light sources around, the night skies here are crystal clear providing spectacular views. There are a number of things apart from the remote location and views that make this hotel so unique and exotic however. First off, everything, and we do really mean EVERYTHING, within the hotel is made from ice. This includes the chairs, beds, glasses, bars etc. All the ice is locally sourced from the nearby Torne River. There is even a chapel within the hotel for guests who wish to be married in a spectacular, haunting, sub-zero and unique setting. In order for all of this to be maintained, the hotel is kept at a positively frigid -5 degrees Celsius on the inside. As a result of this, guests must sleep inside polar tested sleeping bags, which some may find a hardship, but to us sounds cozy. There are also saunas and hot tubs outside to help guests warm up after the cold of indoors. In keeping with the theme of uniqueness the hotel has 100 rooms, of which no two are the same. Each room is designed by an artist who must first submit their plan to a special jury who decides each year what should be built. The same thing happens with the hotel. Each year when spring comes and the temperatures rise the hotel is allowed to melt. This means that the hotel is rebuilt completely each year with a completely different design! Architects queue up to present their vision to the jury who choose the design of the hotel for the coming season. Guests can come again and again and feel like they are getting a different experience each time because it is almost quite literally a new hotel. 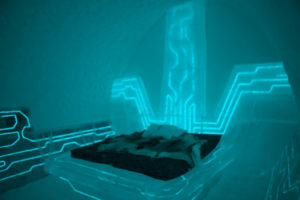 In an attempt to stay ahead of copy-cat hotels that have sprung up since its creation, ICEHOTEL has constantly renovated. 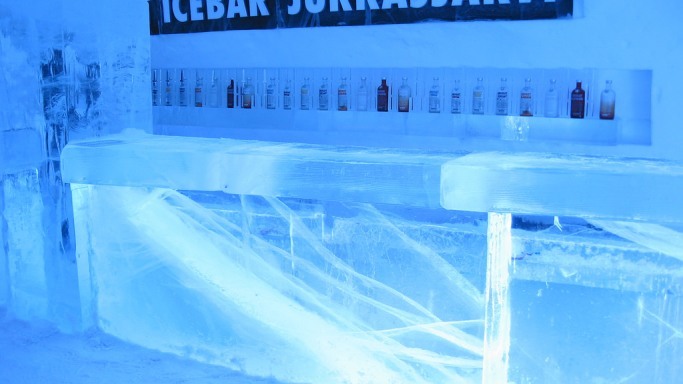 Recently it has opened a new hotel next to ICEHOTEL called ICE365. 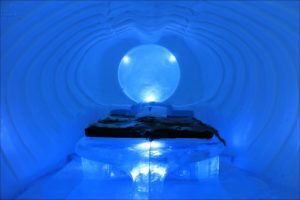 This is the world’s first year round ice hotel, which in keeping with ICEHOTELs environmentally friendly ethos, is kept cold using solar panels making use of the extremely long days that the region has in the summer months. If you’ve got money to spend, as nothing about this place is cheap, and an adventurous soul then this place is definitely for you. Everything about it is individualized and intended to go in harmony with the natural surroundings. All of this makes it in our opinion one of the most unique and exotic resorts in the world.